LG is bringing multiple new monitors to CES in January. 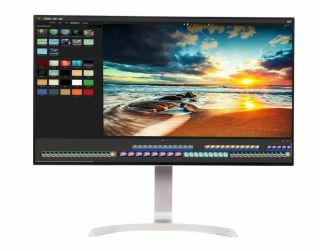 LG Electronics will be introducing a handful of high-quality monitors at CES, which takes place in Las Vegas from January 5 - 8. Most notably, one of the monitors will be the company's first foray into HDR displays, as we rush headlong into the future of 4K and HDR content. First up, LG's 32UD99 is a 32-inch UHD 4K monitor with a resolution of 3840 x 2160. It'll support the HDR10 standard, the same high dynamic range tech used in the PS4, Xbox One, and many TVs and monitors from the top level manufacturers. Essentially, what HDR does is expand the color and contrast ranges of displays to levels way beyond what older technology can do. What that means for you is that games will look better, thanks to more vibrant colors and much-improved contrast. The 32UD99 has an IPS panel, which is what we'd normally recommend because, again, they produce a much better picture quality thanks to the improved colors. The monitor itself is also fairly sleek, with borderless edges and a slim ArcLine stand. As for extra features, the 32UD99 has some built-in speakers, and a handy USB Type-C port. LG also has a couple of ultrawide monitors coming to CES next month. The company says the 34UM79M is the world's first Chromecast-enabled multimedia monitor. It's a 34-inch monitor using the ultrawide 21:9 aspect ratio. Plus, it has a smartphone app which lets you change the monitor's settings from afar. In addition, LG will also be showing off the 34UC99, which is also a 34-inch ultrawide 21:9 monitor. This one is equipped with AMD FreeSync technology, which helps eliminate that pesky screen tearing in your games. LG says it also has 1ms motion blur reduction, Dynamic Action Sync, Black Stabilizer, and more features for all of us gamers. Keep an eye on PC Gamer over the coming weeks for more of what to expect from CES in January.